Mama Nibbles: #NaBloPoMo Challenge for June 4th - Jump! 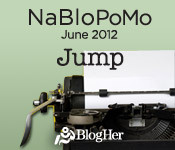 #NaBloPoMo Challenge for June 4th - Jump! What is something you recently jumped into? Recently I jumped into a new crafting experience called Mod Podge! I have never worked with it before so I had no idea what I was doing but now I love it. Mod Podge is really fun and so simple, anybody can do it. I'm part of a larger group of crafty bloggers who are all working on this same Mod Podge campaign and it has been really fun getting to know everyone in the group a little bit. I can't wait to share my project on Mama-Nibbles in the near future.